Well first off the T-Amp needs no introduction, particularly to regular readers of TNT! A little plastic box with a Tripath TA2024 chip producing 6 watts of magic for 30 euro. But what Sonic Impact spawned wasn't just a host of positive, mostly underground reviews, but a whole industry of small companies jumping on the bandwagon. The problem is that few people want to spend 30 euro on an amp; they want something more expensive, more exclusive and more important, they want something that doesn't hang in the air from cables and use spring clips as speaker binding posts! So enter every guy with a soldering iron and access either to a small CNC machine or a Chinese box supplier and voila! You have a T-industry of essentially Sonic Impact T-amps in shiny boxes with the odd component change, big gold plated binding posts and a much bigger (though still low in the grand scheme of things) price tags. Don't get me wrong, these amps are still good value and certainly look better than the original, but not all companies have followed this route, amongst the clones are some people pushing the Tripath to its limits. Enter T-hifi, based in Italy. Here we have a company that's taken a rather different route, providing various DIY improvements and ad-ons to the original T-amp and now launching their own brand of digital amps based on the Tripath chipset. 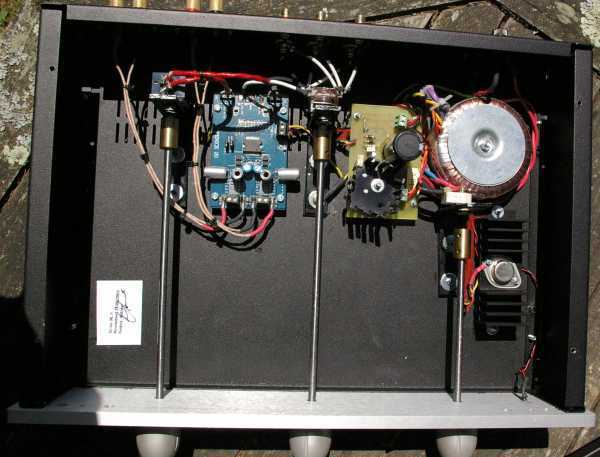 And here's the important part - the T-hifi amps (as opposed to some of their DIY output) is not based on the Sonic Impact amp, the only link being that they both use the same Tripath TA2024 chip. Beyond that even the most casual glance in the box shows nothing from the originator of the revolution. 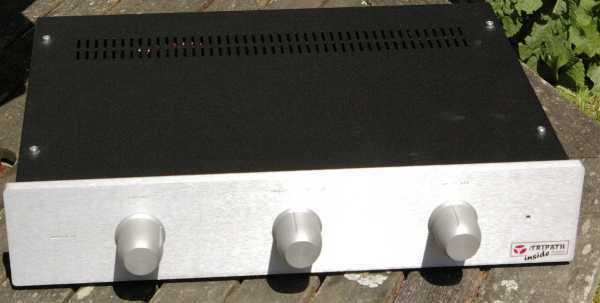 T-hifi are asking a lot for this amp. I know 600 euro isn't a huge amount for a specialist hifi amp, but it is for a transistor-based amp which may only put out 20 watts with a following wind and has just three inputs. It certainly isn't going to be the first port of call for someone looking for something just a bit more special than the T-amp, or even someone who just wants it reboxed - there are other companies that'll do that. The Micro-T is after a different market where customers are less forgiving of rough edges in construction and sound quality. So here we have a very nicely put together, full-width case with the ubiquitous thick, brushed-aluminium frontplate. The knobs are turned anodized aluminium and feel nice - yes I think that's important... The legends for the input and volume are classily machined into the front plate, but as they are not filled with paint they are almost illegible. At the back we find three sets of phono inputs and chunky gold-plated binding posts. So for your 600 € you get a classy box, a state-of-the art digital board with overkill power supply and quality switching and volume pots to make it into a three input integrated. It's been said before that the T-amp redefined the market, nothing at remotely its price came close. In the Micro-T we have a different animal, one that is swimming in a well-populated sea of entry level "proper hifi" amps. The vast majority of these amps, whether from the big names or specialists will be transistor based amps and at this price point most will be capable of 50 - 100 Watt outputs and decent current pumping ability. The Micro-T isn't. Not only is it only 20 watts, but plots of other 2024 based amps I've seen show rapid increase in distortion above 5 Watts. My own experience with several 2024 based digital amps is that though some will drive less efficient speakers, their true magic is in the first handful of watts. Someone once said that "single-ended amps own the first watt", if that is the case then small Tripath amps are trying to steal it back. Even with the better output of the Micro-T I still feel that to a certain extent it's best to regard it as a specialist amp which requires much more careful speaker matching than its mainstream transistor brethren. Two caveats to that statement - if, unlike me, you are not interested in trying to reproduce the dynamic swings of real music, or you are limited by location or inclination to low levels then you can ignore this advice. Also I'm informed that whereas most valve amps like speakers with high impedance (e.g. 16 ohms) digital amps don't. One advantage of holding back the review for so long was that it coincided with the completion of my project using Acoustic Nirvana drivers (circa 96 dbl efficiency) so that I could try the amp with some real-world high-efficiency speakers as well as my Loth-X Polaris horns (104 dbl...). As well as these I also tried the amp with my IPL S3 transmission line speakers (89 dbl) which were OK without being special, and a pair of Pen Audio mini-monitors (<86 dbl) which not only clipped at anything approaching decent listening levels, but also sounded severely "sat on". Neither speaker was used in the review. So given speakers that gave the headroom for the little amp to breathe easy what was the result? There is something special about these low-powered digital amps. The sound they produce seems to have huge detail and the sound staging and atmosphere impossibly big for such a cheap amplifier. These comments apply to the T-amp but also to the Micro, and here note the 'cheap amplifier'. Obviously the T-amp is impossibly cheap, but the Micro sets new standards for me at anything near its much higher price point and obviously outstrips the T-amp. That sound staging is remarkable, sometimes even being around-your-head in the manner of headphones. It's also immensely fast, something particularly noticeable with percussion. PJ Harveys "Stories from the City, Stories from the Sea' album (buy it) is a pretty murky mix all-round with her often distorted voice pushed out at you. The tragedy is that this masks some of the most incredible speed/power drumming I've ever heard on "Kamikaze" where Rob Ellis rips into a frenzy of beats all around the drumkit. Usually this is softened and pushed into a sludge in the background. But the Micro managed to pull this forward and separate strikes to counterpoint the "torn calico" distortions of Ms Harveys vocal. This ability to pick leading edges surfaced again with Robert Plant and The Strange Sensations new Album "The Mighty Rearranger" which opens with almost a square-wave distortion to the old masters voice. I've heard this sound rather phasey and fluffy on lesser amps, the Micro made sense of it. Changing track, Gerard Frezina is an Italian jazz maestro and his band play in rather the St Etienne mould, only I think they're better:-) His album "Hi Note" combines some massive circular drum and bass rhythms with superb instrumentals elsewhere in more traditional jazz roles. Here the T-amp would have floundered, simply rolling off the massive bass (the T-amp rolls off quite steeply below 200 Hz) and exposing cornet etc whereas the Micro kept the balance so the soloing instruments cut though the weight of the drum and bass. It's this power and control in the lower octaves which is what hits you compared to the T-amp but in reality the Micro equals or betters it in all areas - as it should given the price. So having dispensed with the T-amp it's important to look at the other two families of specialist amps that the Micro will inevitably be compared with. First is the rash of cheap Chinese valve amps, often using El34's in push-pull. I can dispense with these quite quickly. If you are looking for a warm and woolly, pipe-and slippers sound then the better of these will give you what you want, but 600 euro is just not enough for a decent valve amp no matter where it is made. In all areas that matter to me in music the Micro will comfortably outperform these amps (note - here I'm generalising, who knows what's out there?). The other type of amp is rather different and these are the chip based 'gainclone' amps typified by the JLTi. Although this is nearly twice the price of the Micro it does include a quality valve preamp in the mix rather than the passive input of the Micro and that must be worth something. I have to say that the two have characters different enough for one person to prefer one amp and another the other amp. Though the Micro will produce a more dramatic soundstage and ultimately manages to dig more detail out of any recording the JLTi has a beguiling warmth and organic quality that allows music to flow rather than distract; it's also noticeably more powerful. Both are excellent but in my system the JLTi has it by a nose though YMMV. What is nice is that we have the choice! But people are putting such amps against megabuck opposition so here's my take on the matter. Long ago my own preferences in amplifiers (and music) drew me to the world of SE valve amps, my own costing some 10X the asking price of the Micro. Does the Micro make me wish I'd spent the money elsewhere? Thankfully not. Though digital amps have had rave reviews and are without question fabulous value for money they are not perfect. I still feel they are a little grey and soulless, and sometimes I get the feeling that their soundstaging can be just a bit artificial, almost as if they are messing about with phase. Now no SE fan is going to pretend that his/her chosen amps are uncoloured, but it's a question of what flavour you want your music. In fact the Micro reminds me a little of a good EL34 amp without quite so much warmth, and as such amps are going to cost many times that of the Micro it's a good place to start. I thank Geoff for the confirmation of my aim to keep the best from the TA 2024. I fully agree with Geoff about the sound quality of the Micro Ti. Geoff is skilled at choosing suitable speakers, it is advisable that customers follow his example in selecting speakers of enough efficiency, then they will enjoy the full quality of the fabulous TA 2024 without any problem . The only complaint was about the legends (very minor - Geoff), these are machined, but Geoff says that these are illegible because not filled with paint. For this choice I was inspired by some old AudioNote amps which make the legends invisible at a distance, but when the knobs are within reach of hands are also within reach of eyes. It also gives a cleaner look. I want to thank my friend Carlo Morsiani , the tonearm and turntable manufacturer, he shared with me the enthusiasm about the sound of the Tripath chips, and he helped me in mechanical details, contributing to the development of the Micro amp. Now this development is going forward. 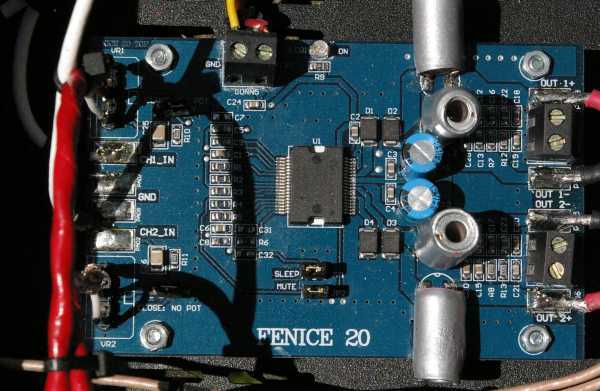 The Tripath TA 2022 chip allows more power with the same kind of sound , so two amplifiers can be installed in one cabinet for multiamplification purpose, one TA 2022 for bass and one TA 2024 for highs.